Once again, Thanksgiving has snuck up on me! You’d think I would learn by now! 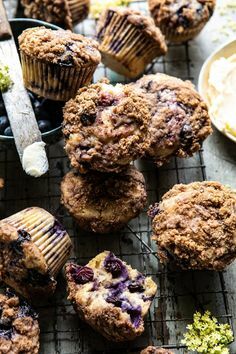 So, I’ve been madly pinning inspirational Thanksgiving ideas on our Pinterest board! 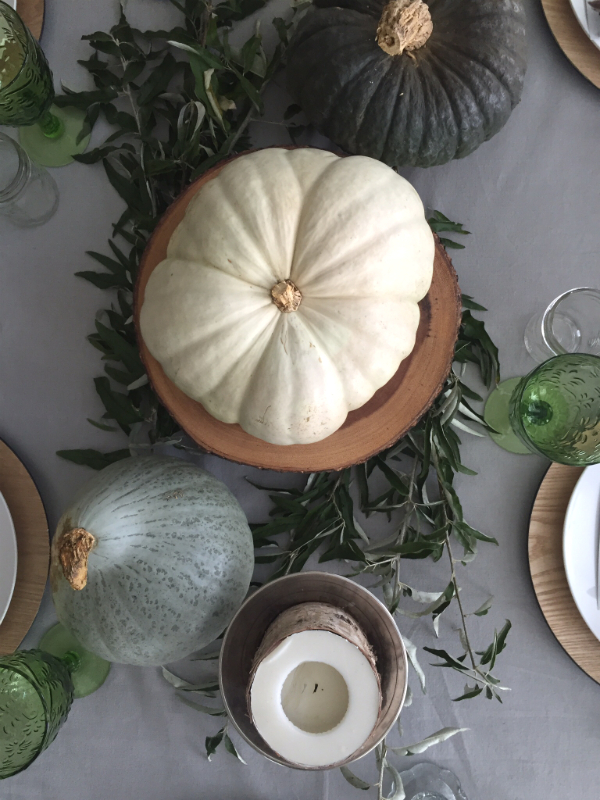 We are having friends over for Thanksgiving dinner, so I want the table to look special…but the focus should be on visiting and great food and not stressing about the decorations. So, I’m focusing on simple. 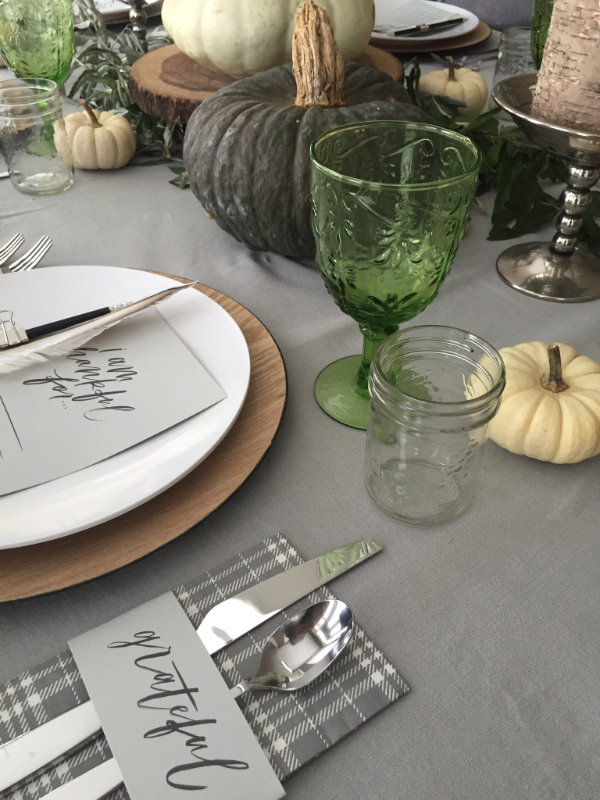 I love the Thanksgiving ideas from this post by Oh My Deer. 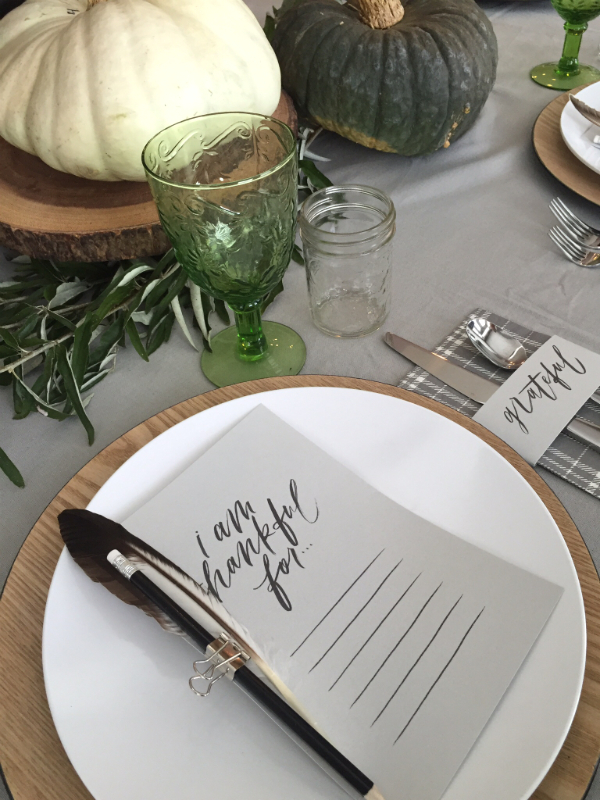 I love the idea of everyone filling out the “I am thankful for” lists. I had great intentions of getting craft paper and tracing her stylized lettering with a special white marker….but I had to order the marker online and I just ran out of time! 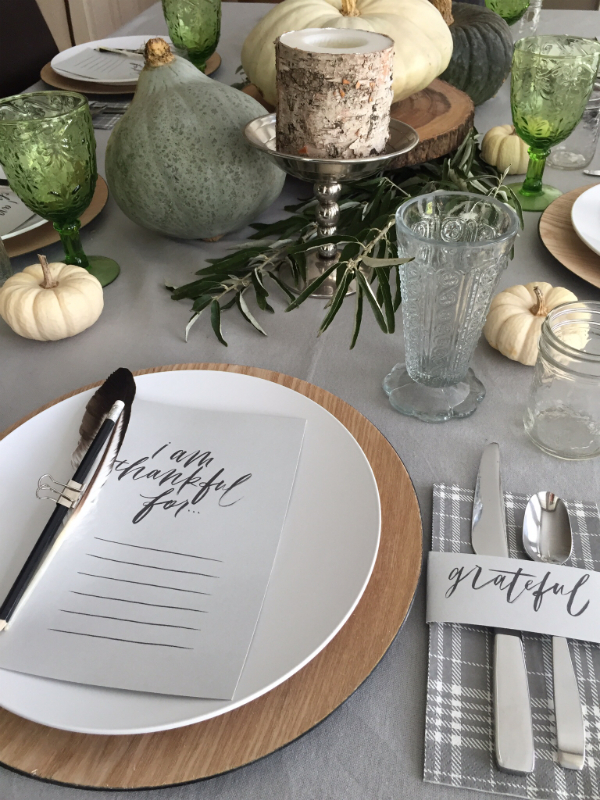 So, I told myself to simplify….so I used her Thanksgiving printable files and printed the “I am thankful for” lists on grey cover stock and cut them down. Ok…that seriously just took a few minutes. I attached a pencil and feather to each list with a silver binder clip. A wooden clothes pin would be cute too! 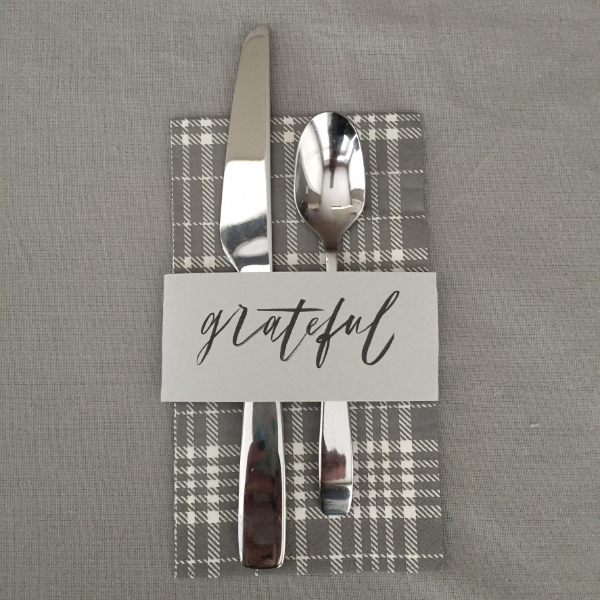 I also printed out the “grateful” napkin wraps on the grey cover stock and cut them to size. I headed to my favorite pumpkin patch and picked up a large white pumpkin, minis and some large, interesting green gourds. I thought they were pretty cool….and my kids thought they were weird! Whatevs! I think they are awesome! I love these napkins from the dollar store. I love combining different patterns and colors. I cut some branches off a tree outside to add some greenery to the table. And I added candles that I already had at home. 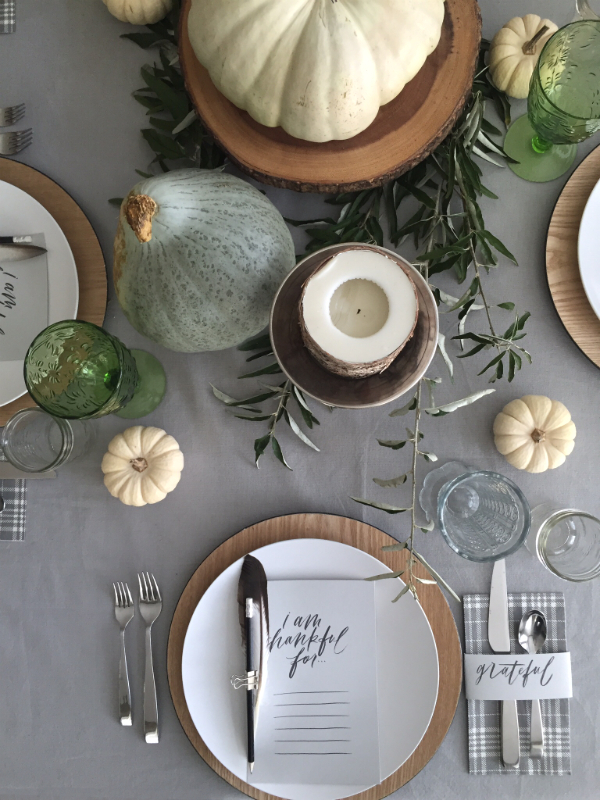 You may not have a ton of time to decorate your table for Thanksgiving. It’s all good! 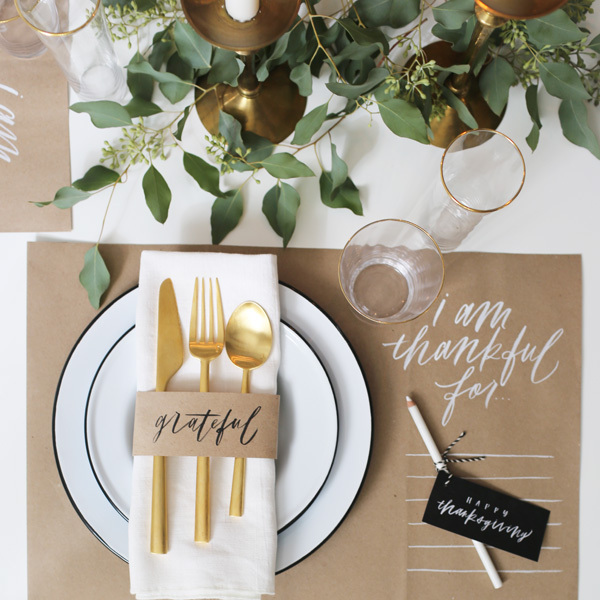 These thankful lists and napkin wraps are two simple things that really add a personal touch to your table without a huge amount of time, effort or expense. You can just use whatever paper you might have on hand. 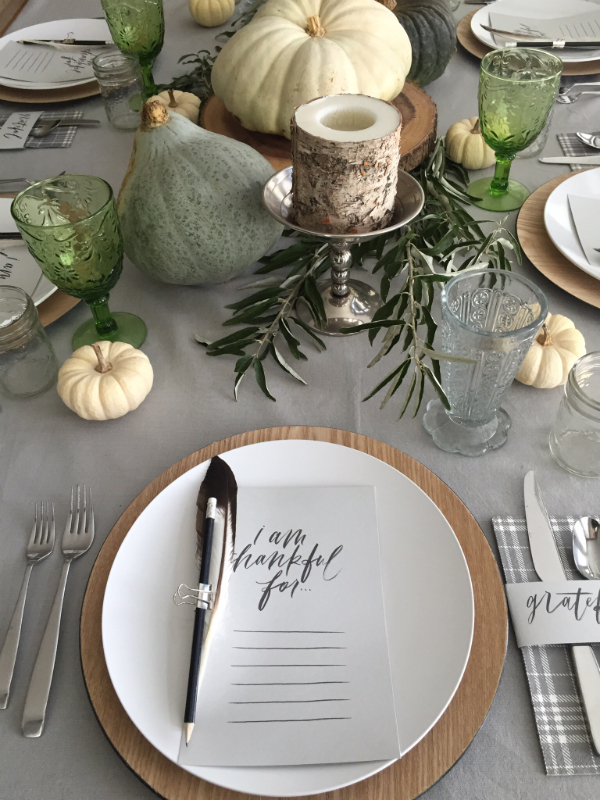 And I’m sure that those thankful lists will start some interesting conversations around the table! 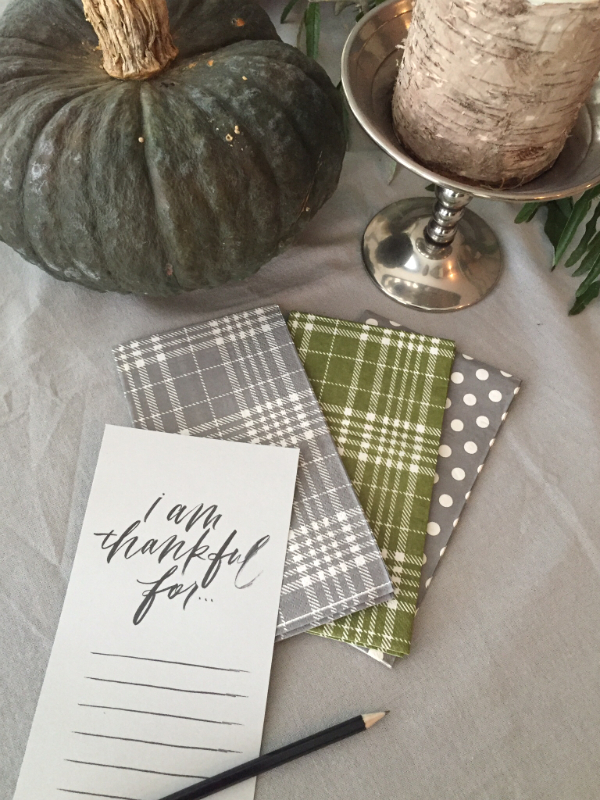 If you use any of these printables from Oh My Deer, be sure to share them on Instagram with the hashtag #ichoosethankfulness!